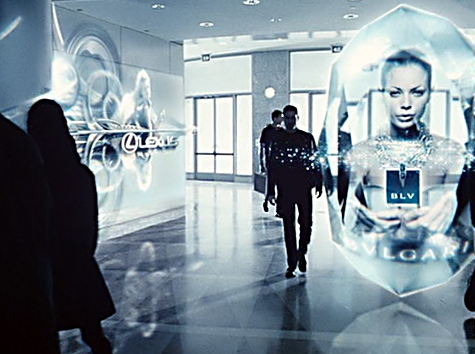 Moments of Conception 184: The Advertising Scene from Minority Report ~ HELLO, my name is Blog! There’s no plasticity of the self. I have zero sense of direction. Even with the assistance of the satellite navigation system in my phone, it’s still hard for me to find my way around sometimes. And I’m okay with that. I’ve long since made peace with my directional incompetence. Besides, what’s so bad about getting lost? Is there any shame in having no sense of direction? I love getting lost. It’s essential part of the human experience. It’s how we learn to trust ourselves. It’s how we make room for chance encounters. And it’s how we expose ourselves to things outside of our interest. What’s sad is, technology is slowly obfuscating that experience. Now that every aspect of our world is hyperpersonlized, ubertargeted and supernichefied, getting lost is quietly becoming a thing of the past. Pariser named this phenomenon the filter bubble, whereby web algorithms selectively guess what information a user would like to see based on information about them. Like my friend who does a lot of online dating on her cell phone. It’s amazing. She can adjust her algorithms to only seek out divorced dark skinned men over forty who love riding motorcycles and eating organic grass fed beef who live within a fifteen mile radius of her home. Which sounds ideal, and it is. But the problem with idealism is, we don’t experience the virtue of being exposed to things outside of our interest. There’s no plasticity of the self. Pariser’s research actually showed that without practicing that kind of categorical openness, it’s harder for luck and ingenuity to find us. Wow. I can’t imagine living in a world where we only got what we wanted. Are you isolating yourself into your own cultural and ideological bubbles? True life takes place in opening. Pariser’s book explained that personalization filters serve up a kind of invisible autopropaganda, indoctrinating us with our own ideas, amplifying our desire for things that are familiar and leaving us oblivious to the dangers lurking in the dark territory of the unknown. Yikes. That reads like a dystopian fiction novel. Like the internet has some hidden agenda to keep humanity small, scared, stupid and dreamless, incapable of critical thinking. Then again, are we really that far away from such a reality? Not anymore. And that’s what makes this scene so prophetic. Spielberg’s movie predicted the implementation of biometric recognition in customized advertising. That’s completely terrifying. I know it sounds paranoid, but what’s worse, thinking you’re being paranoid, or knowing that you should be? The point is, we have an obligation, as citizens, to maintain and develop our capacity for openness. To keep ourselves from becoming like the characters in this movie. In fact, the prevailing theories on personality found that openness to experience was by far the most salient characteristic of high creativity and intelligence. People with high openness were more likely to have high active imaginations, aesthetic sensitivity, attentiveness to inner feelings, preference for variety and intellectual curiosity. Sounds better than having a hologram ask me how those new boot cut jeans are fitting. Remember, true life takes place in opening, not closing. Are you still protecting yourself from information that disagrees from your viewpoints? Your memories aren’t invited. Rehashing the same old stories with the same old people is an enjoyable and comforting and nostalgic activity. And why shouldn’t it be? Roles are clearly defined and the status quo is easily preserved. Everyone is happy, and nobody has to change. However, recycling old memories and pretending that they’re fresh gets very old, very quickly. It feels like you’re trapped in an infinite regression. A dull blanket of sameness. A snake eating its own tail. And before you know it, every interaction becomes a cannibalistic photocopy of the one before. Every person remains frozen in the position they met each other in. And nobody grows. Blech. But it doesn’t have to be this way. It is possible to evolve the conversation. All it takes is one courageous person who dares to raise the needle on the record and say, guys, all we ever do is talk about old stories. Let’s go create new stories. The point is, building momentum doesn’t require anything complex, simply a moment that adds energy to the system. When was the last time you did something for the first time?